See Agenda for a complete list. See Events Diary for a complete list. Tuesday 4th December 2018 at 6:30pm. By the Mayor of Blackrod & Friends. Following the dedication everyone is warmly invited to refreshments and more Carol singing at St. Andrews, Hill Lane, Blackrod BL6 5JP. Open THIS POSTER for more details. The Mayor, Town Clerk and Council Members would like to give an enormous thank you to all the members of Blackrod Community and others, who turned out to support the recent 2018 Remembrance Day Service. The hundreds of people who turned up at the Cenotaph on a drizzly grey morning exceeded all expectations and showed the true grit of Blackrod folks who were determined that this years’ Service of Remembrance including the commemoration of the end of World War One would be a fitting tribute – even if a band hadn’t been made available! Volunteer Pipers , Drum and Trumpet Players, Collective Blackrod School Choirs and music played through a tannoy system to the marching crowds all played their part in making the Remembrance Service a success as well as those who assisted in the background. Well Done everyone you made the Village of Blackrod extremely proud. The Blackrod Service of Remembrance and Maroons will both take place on Sunday 11th November 2018 from 10.30am. Proceedings will commence at the Cenotaph in the Cemetery Grounds promptly at 10.30am and include a collective Blackrod schools choir in addition to the normal service of Remembrance. The second part of the service will continue with the Remembrance Day Parade leaving the Cenotaph at approximately 11.05am and marching through the village to St Katharine’s Church for the Remembrance Day Service which will commence at approximately 11.45am. Friday 29th June, 11 am - 1 pm. Have you heard about the Bolton Plan for health and care? This is YOUR chance to meet some of the people who will be supporting YOUR neighbourhood. Health and Wellbeing Market Place. Open THIS POSTER for more details. Blackrod have a new Mayor. At the Annual Meeting of the Town Council attended by over 55 friends, family and local residents, Councillor Mr Scott Batchelor was elected to become the Town Mayor for the year 2018-2019. Councillor Batchelor will be joined by his Mayoress Mrs Karen Batchelor and supported by Deputy Mayor Councillor Mr John Price and wife Sandra. 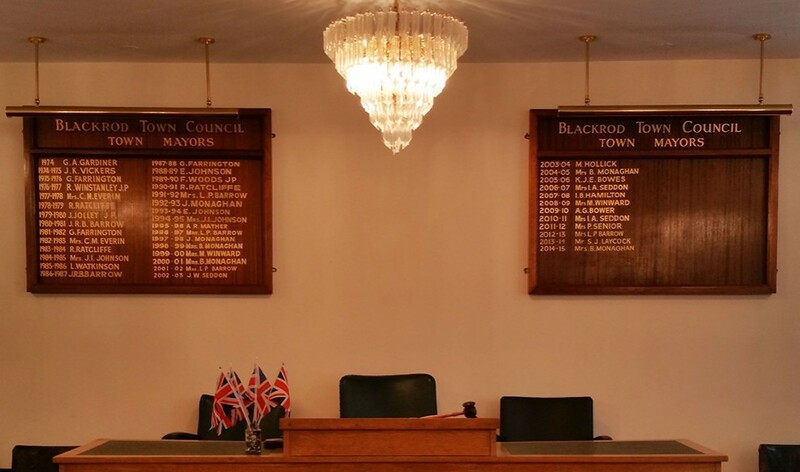 Blackrod Town Council wish the new civic dignitaries all the very best for the forthcoming year when they will be out and about representing the local residents of Blackrod over a very busy year. Blackrod Town Council are pleased to announce that they have successfully Co-opted a new member of the team. Mrs Susan Gaskell has been appointed as Councillor for the Central Ward of Blackrod, replacing Mrs Ann Cunliffe who retired from her Local council role., Friends and family joined Susan and fellow councillors to witness Mrs Gaskell take her Oath of Office of Town Councillor at the council meeting held on April 30th. The Town Council is now fully represented again across all three wards in the village. Retiring Mayor Councillor Mrs Isabel Seddon presented over £3500, raised through her Mayoral year to local charities and good causes. These included Bolton Parkinsons Group: Blackrod Guiding Association and AFC Masters a local disability group. Friends and family and local dignitaries gathered at the Annual Meeting of the Town Council to wish Councillor Mrs Seddon a well earned rest after a long event filled year. The retiring Mayor was presented with a beautiful flower arrangement as a thank you from Town Council colleagues. It is our hope that you will find it a useful resource not just for all the residents of Blackrod and its surrounding areas, but also for visitors to the area. You will find contact information for your councillors as well as information about council meetings, agendas and events, also we have included some handy links to other websites that we think you may find useful. 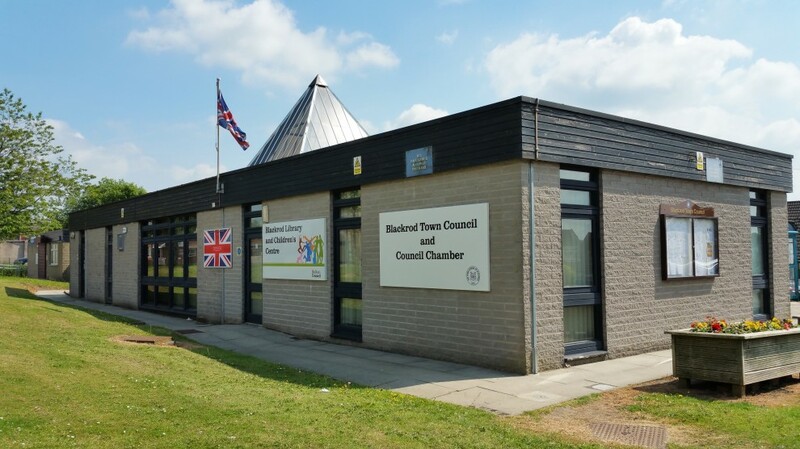 Please explore the site and if you have any comments or suggestions as to other things that could be added at a later date, contact The Town Clerk and Proper Officer for the Town Council of Blackrod using the details on the ‘Contact’ menu. Thank you for taking the time to look at our website, and we hope to welcome you back soon.